I got a fully black brick, 20 coin doors, ninja smiley, female smiley, coy smiley, Ooh! smiley, small world, wide world, 5 spawn points, large world, new year pack, factory package, medium world, massive world, valentines smiley, terminator smiley, secret bricks, and great saved world. I have about 10 magic coins, all are energy, still no wizard. wtf is a great saved world??? I have got a massive and a large world, Ohh! smiley, 2 spawns, x-mas deco, fully black. I GOT THE FAN SMILEY. 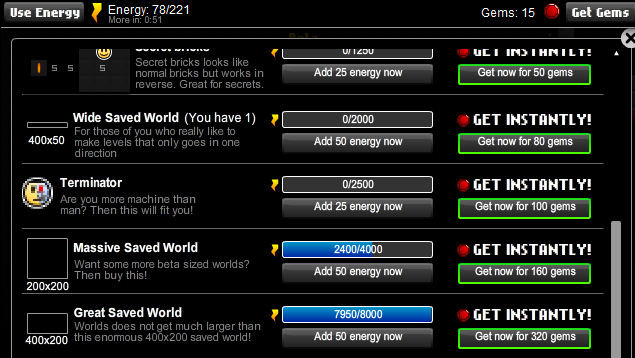 And, I also got the Great World with energy. notice he got the great saved? I also got the wizard and great saved world. I have 12 Spawn Points, 5 Small Worlds, 1 Medium World, 10 Coin Doors, 1 Large World, 1 Wide World, 2 Massive Worlds, A Beta World, and a Beta only world. Must I say more!? Maybe you should add another prize when getting a magic coin. Recently, it has only been a glitch but what if when you obtain a magic coin ( low possibility of getting it) you do not only to have a chance of obtaining a wizard smiley but yet a chance to obtain a green coin. Wizarddddddddddddddddddddddddddddddddd!!!!!!!!!!!!!!!!!!!!!!!!!!!!!!!!!!!!!!! I took the wizarddddddddddddddddddddddddddddddddddddddddddddddddddddd!!!!!!!!!!!!!!!!!!!!!!!! I have: 1 Small World, 1 Medium World, 1 Wide World, 3 spawns, 10 coin doors, ninja, santa, worker, Oh!, coy smileys. secret passage. It's difficult getting everything with energy.